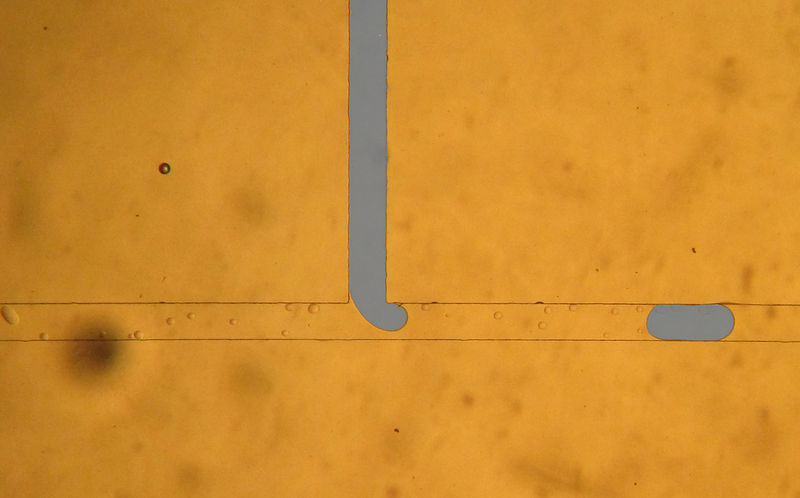 We simulate drop formation in microfluidic devices. The research support from NSF grants DMS 0713256 and DMS 1016381 are gratefully acknowledged. First illustration: Numerical simulation of droplet formation in a T-junction (click picture for animation). Continuous phase fluid travels 10 times faster than the "droplet" fluid. Square cross section 1E-4 cm^2. Effective fine grid resolution: 256x64x32. Contact angle: 135 degrees. Size of the droplets consistently have an effective diameter of 0.011cm which is in agreement with experiment and simulation reported by van der Graaf et al, Langmuir 2006, 22(9), 4144-4152 (continuous phase flow rate v_max=8.3cm/s). This work with Dr. Austen Duffy (recent PhD, Florida State applied math), and Dr. Michael Roper (Florida State, Department of chemistry and biochemistry). 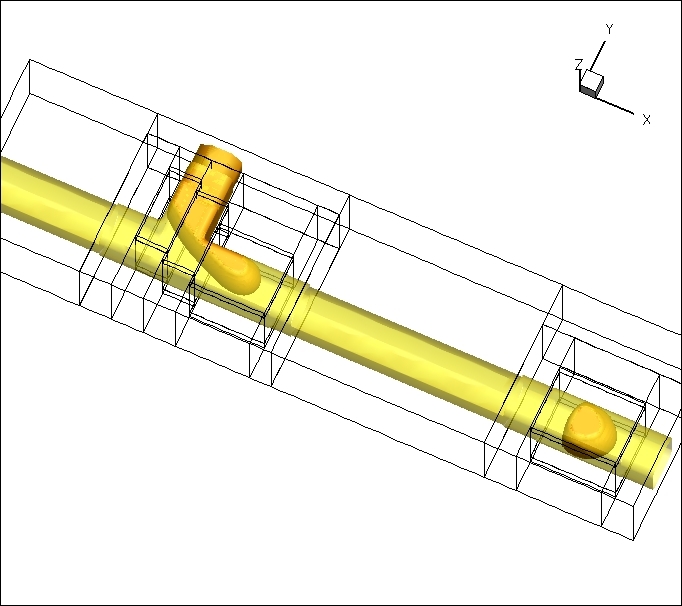 Second illustration: Numerical simulation of droplet formation in a head-on microfluidic device (click picture for animation). Continuous phase fluid (water) enters from the bottom (Q=0.05 micro-liter/min) and dispersed phase fluid (oil) enters from the top (Q=0.1 micro-liter/min). 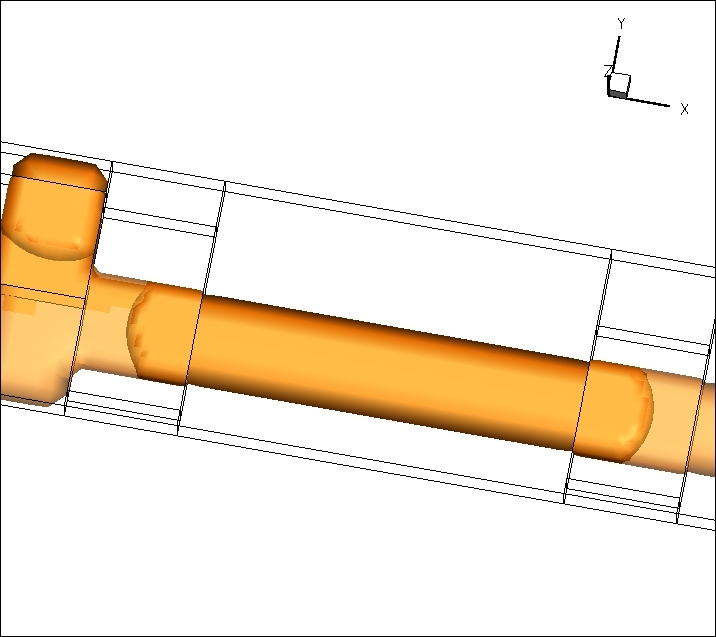 Channel height is 10 microns and channel width is 30 microns. Contact angle is prescribed at 135 degrees. The numerical algorithm predicts a droplet length of 162 microns. Experiments from Figure 7 of Shui et al (Lab on a chip, 2009) show droplets with length 143 microns. Effective fine grid resolution: 128x32x4. This work with Dr. Austen Duffy (recent PhD, Florida State applied math), Matt Jemison (PhD student, Florida State applied math) and Dr. Michael Roper (Florida State, Department of chemistry and biochemistry). Third illustration: Numerical simulation together with experiments (conducted in M. Ropers' lab) for droplet formation in a T-junction (click picture for animation). Continuous phase fluid (oil) enters from the left (Q=1.3 micro-liter/min) and dispersed phase fluid (water) enters from the top (Q=0.3 micro-liter/min). 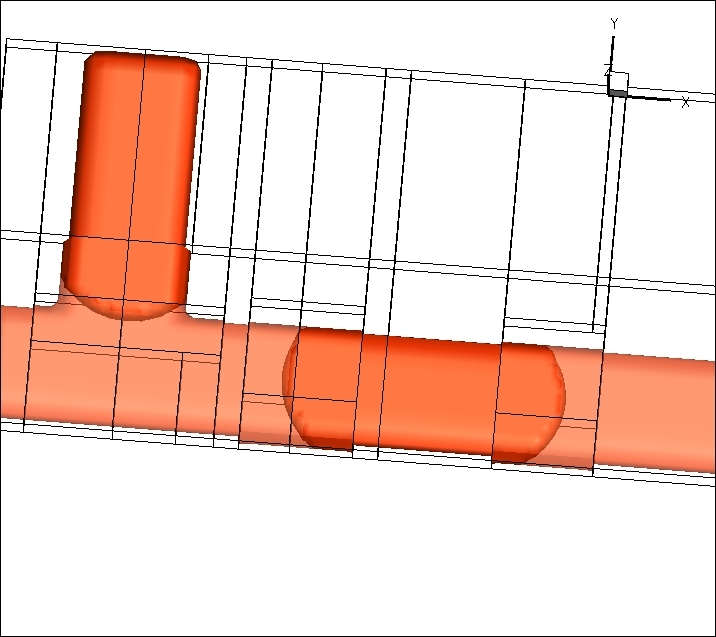 The channel has a trapezoidal cross section with dimensions close to 185 microns wide by 37 microns high. The contact angle is prescribed at 135 degrees. The numerical algorithm predicts a droplet length of 415 microns. Experiments show a droplet length of 444 microns. Effective fine grid resolution: 128x64x4. This work with Dr. Austen Duffy (recent PhD, Florida State applied math), and Dr. Michael Roper (Florida State, Department of chemistry and biochemistry).